Brixton 1985 by Christine Thomas. Keim Silicate?. Designed by Christine Thomas it tells the story of the hidden River Effra and the work of the women at the Lambeth Doulton factory in Vauxhall. In 1985, artistic director of Wandsworth arts, Christine Thomas, was approached by a newly formed housing association, the Bonham and Strathleven Housing co-op, to design a mural as part of an improvement package for the local area. Christine, an experienced mural artist with work such as the Tapestry of life, off Lavender Hill, set about consulting 450 local residents about whether they wanted a mural and what they would like to see in it. She produced several designs which had to take into account the window in the gable wall of the house on which the mural would be painted. This was a collective project with the housing community and locals, so they were involved in every stage of the process. Local children were taken to the White City Leisure Pool so that photographs could be taken of them playing which could be used in the mural. Children’s photos were also taken at a local special school as part of an inclusivity initiative. 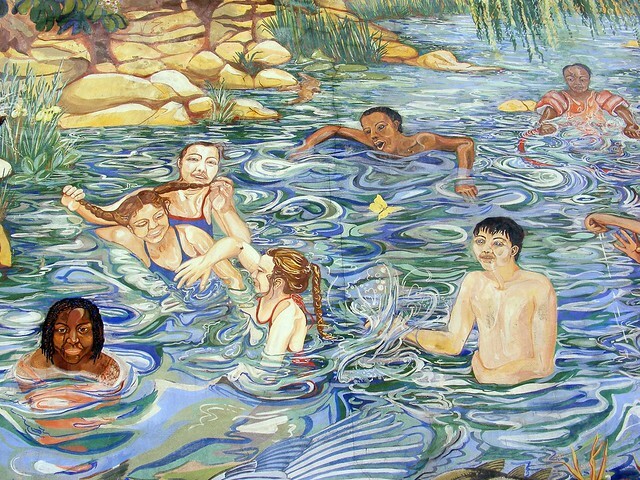 In the July of 1985, with the assistance of community artists, Diana Leary and Dave Bangs, the mural was begun. A scaffold was set up and the wall was rendered. Unfortunately some residents were upset as they disagreed with the mural, feeling that their opinion hadn’t been taken into account. They started a petition which was reported in the local newspaper but this action led to nothing and the mural went ahead. Completed in December 1985 and opened by the mayor of Lambeth, the colourful mural looked amazing on the wall overlooking Glenelg Road. In the left of the mural there is a water mill, based on a Flour Mill on the National Trust's Bateman's Estate in Sussex. In the painted windows of the mill, people look out of the window; the old man in the top, wearing a blazer, had taken part in the 1948 Olympic Games in Hyde Park. Doves roost in the top of the building and as you move down to the riverside, other residents sit on the jetty at the front of the house. The mural is teaming with wildlife; there are swallows, grebes, geese, butterflies, various flowers and plants painted with much accuracy. The river’s water, based on the idea of the River Effra, which was local to Brixton, fills much of the right hand side and the far riverbank is full of beautifully painted trees. In the river, children play and on the closer river bank, many vases sit. This is the pottery painted by the women of the Lambeth Doulton pottery factory in Vauxhall. The vase designs come from a book of the women’s design held at Lambeth Archives. The incorporation of these women’s work was to celebrate the opportunity which they had in a time when they would have more likely ended up as domestic servants. In the mural, a woman sits painting a vase. This is a portrait of Christine Thomas, the mural’s creator. At nearly 25 years old, the mural is wearing well and the children will have grown up but for a moment they are captured in time in a great example of a community mural. Overall the mural is in good condition although undoubtedly slightly faded from the sunlight. There is evidence of some paint peel damage at the bottom of the mural and water damage at the top. Someone has thrown a food item onto the mural which had left a nasty mark. However, with the whole mural , it could be possible to sort out certain areas. The mural can be found located off Acre Lane on the junction of Strathleven Road and Glenelg Road. It is located on the side of a house and so is at street level.